This bathroom design exudes the luxury and comfort offered by resorts and five star hotels, with a million dollar view adding to the rich interiors and extravagant design styles. There is a central bathtub, large and comfortable, in white porcelain, inlaid in wood. The plush exteriors exude a lavish charm, with the rich porcelain and velvet seating arrangement at the foot of the tub creating a luxurious undertone. The bath towels are kept upon wooden platforms that also double up as steps leading to the bathtub. 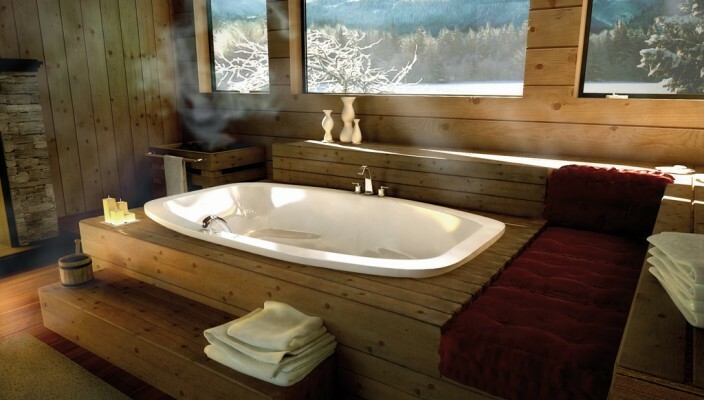 The bathroom overlooks an exquisite mountainside view that beckons the onlooker to dreamy landscapes that soothe the senses white they take an exfoliating and relaxing bath. The wood panels on the walls all complement the floor and windows quite well giving it a “cabin in the woods” feel. Little bathroom accessories and scented candles add to the aesthetic sensibilities that dominate this room.